Chop the onion. Place a large skillet over medium heat, add the olive oil, and onion and sauté. Stir occasionally until onions start to brown, about seven minutes. Chop the carrot and parsley. Wash the lentils and check for stones. Strain them and add them to the onions, along with rest of the ingredients, except for the potatoes. Cover with a lid, or aluminum oil, and bring to a simmer. Wash, peel, and chop the potatoes into two inch long pieces (or large bite sized pieces but they will take less time to cook). Place the potatoes on top of the lentils. Cook the lentils and potatoes until they are tender, about 20 minutes. If the liquid is soaked up but the lentils are not cooked, just add more stock and bring it to a simmer until lentils are tender. Once they are cooked, stir in the salt, soy sauce, and additional parsley if you like. Tips: Serve with pilaf or gluten free flatbread. These lentils are also excellent with a generous side of yogurt — or So Delicious vegan coconut yogurt alternative. This dish is a great make-ahead meal. Note: Toor dal are split pigeon peas, but you can use other kinds of dal or lentils instead, just keep in mind the cook time. Red lentils cook quickly so the potatoes need to be added right away in bite sized pieces. Dice the onion. Place a large, wide pan over medium heat. Add 1 tbsp olive oil along with the onions. Turn burner down to medium low and sauté for 5 minutes. Meanwhile, zest and juice the lime and reserve until needed. Add the garlic to the pan and sauté for 1 minute. Turn the burner up to medium. Add 1 cup rice and 1/2 cup white wine. Stir until most of the wine has been absorbed. Then add 1 cup of broth, and bring to a simmer. Stir every few minutes. Add the parsley, thyme, spices, lime juice, and 2 tbsp olive oil. Once most of the stock is absorbed add the second cup of stock along with the soy sauce, stirring occasionally. Heat a second pan over medium heat and sauté the mushrooms in two batches, for about 4 minutes, just until they start to not look raw. Once the second cup of stock is almost absorbed by the rice, add 1 more cup of stock and the mushrooms to the rice. Simmer until mostly absorbed, stirring occasionally. Once the stock is almost completely absorbed, turn off the the burner and season to taste, adding the lime zest, salt or pepper as needed. Note: the rice should be al dente or just cooked (depending how you like it)—if it is not cooked to you liking add more broth and simmer just until it is absorbed. Serve warm and enjoy the leftovers! For a dessert, enjoy with melted chocolate and whipped coconut cream. Or, for a savory crepe, sauté some maitake mushrooms with olive oil and bok choy. If you eat meat, you can toss in just a few pieces of smoked salmon and you will have a delicious and memorable meal. Optional: you can add spices or herbs of your choice, like paprika or black pepper. Begin by warming the water so that the olive oil does not solidify when added to the bowl. Then mix all ingredients together in a large bowl for 1 minute or blend in the blender for thirty seconds. Heat a large skillet over medium heat. I use a twelve inch cast iron which works nicely. * Add one tsp of olive oil (or preferred oil) and then pour in about 1/4 to 1/3 cup of batter (scoop the batter from the bottom of the bowl in case it is not fully amalgamated). Right after you pour the batter into the pan, tilt it around in a quick circular motion to get the crepe batter to spread. Once the crepe is solid it is cooked through and can be flipped. Cook on the second side briefly, about 30 seconds, before transferring to a plate. Add one tablespoon of water if the batter does not spread to 1/4 inch thickness. Once cooled to room temperature, the crepes can be kept in the fridge for about 2-3 days in an airtight container. *If you are not used to cooking crepes, you will have to make a few to get the hang of it. If they break, you are probably trying to flip them too soon. You can oil the pan again after cook a few crepes to help them release. This recipe is excellent served over flatbread. The flatbread recipe follows this recipe and I suggest making it first so that the bread is ready and warm. If you don't want to bake, you can serve this recipe over corn tortillas. Dice the vegetables and mince the parsley and fresh thyme if using. Heat a skillet over medium heat. Add 1 tbsp olive oil along with the onion, carrots, sweet potatoes, spices, thyme, salt and 1/2 of the parsley Turn the heat down to medium low and allow to sauté for about 7 minutes. Then add the diced red pepper and zucchini and cook for about 5 minutes or until all the vegetables are tender. Stir in the rest of the parsley, vinegar, coconut sugar, and more salt if needed. Mince the cilantro. 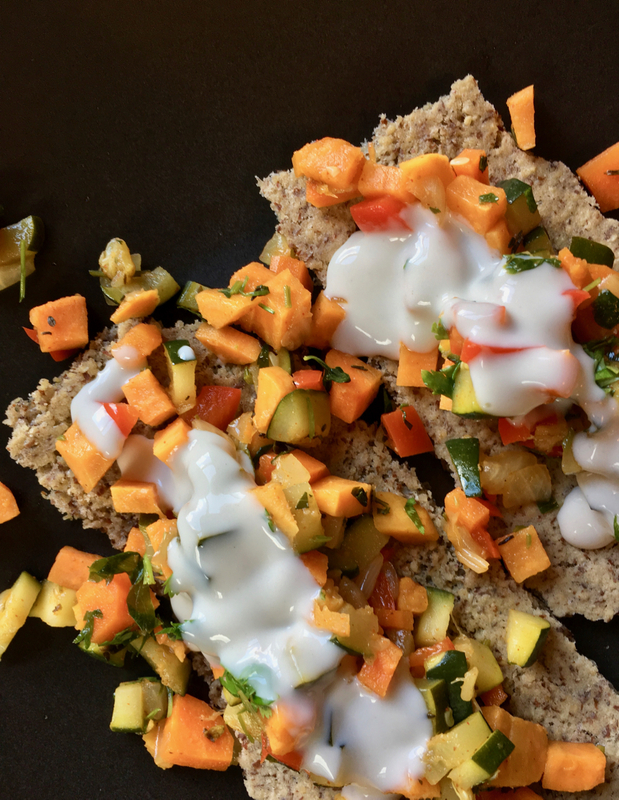 Serve the vegetables over flatbread with yogurt and cilantro. This dish keeps well in the fridge for 2-3 days. This recipe has been adapted from The Essential Gluten Free Baking Guide. It is gum-free. Preheat the oven to 400°F. Grease a 12x14 inch cookie sheet or use two smaller sheets. Whisk together the first five dry ingredients. Pour the water mixture into the dry ingredients and stir until just combined. You want the mixture to be thick enough that it needs to be spread with the help of a spatula (if it is too thin, it will not rise). If the mixture is too thick, add a little more water. It should be thicker than pancake batter but thin enough that it will pour. Bake for about 20 minutes, or until the edges start to brown. The bread is best eaten fresh, once it has cooled, but it can be stored in an airtight container in the the fridge or freezer and reheated in the toaster. Gather all of your ingredients. If you are using soaked chickpeas, put them in a sauce pan, cover them with water and bring to a boil. Then immediately simmer on low for about 15 minutes with the lid on. Meanwhile, heat a large pan over medium heat. Add the bacon and allow it to brown. If the bacon is truly lean, you may need to add a teaspoon of olive oil (or your preferred oil). Flip the bacon and brown the second side, then remove it from the pan and allow it to cool. While the bacon browns, slice the cauliflower and green beans into bite sized pieces. After removing the bacon, put all of the other ingredients into the pan, including enough water to cover them and bring the soup to a boil, then immediately turn the burner down to low and allow the soup to simmer. Slice the bacon (or cut with scissors) and add it to the pot. Simmer until all of the ingredients are tender. This soup only gets better with time. The first night it will be very good, but after resting for two days in the fridge, the flavors meld together and it is a match made in heaven. * Lean bacon is an excellent source of flavor for soups and it is what people have been using for centuries. If you find a local farm that sells pork, the bacon is likely delicious lean bacon which is more common in Europe than in the U.S. You can use regular lean bacon if your source does not have the smoked option. I usually buy the ends, which are cheaper. ** For vegan, substitute smoke flavor to taste, and 1/4 cup nutritional yeast.